There is momentum for improving Turkey's frayed relations with the West even as it warms up to Russia, a senior Turkish government adviser told VOA on condition of anonymity, days after Turkish President Recep Tayyip Erdogan was re-elected. Erdogan's adviser said that in February, during a visit by then-U.S. Secretary of State Rex Tillerson, both sides committed to the creation of a road map to address many differences that had sent relations between Washington and Ankara plunging to a crisis point. The adviser noted that bilateral relations were "better than six months ago, thanks to steps agreed on during Tillerson's visit." He said the process led to the recent withdrawal of the Syrian Kurdish YPG militia from the Syrian city of Manbij. Ankara accuses the YPG of being linked to Kurdish insurgents fighting in Turkey. Washington, however, has backed the militia in the war against Islamic State. The YPG’s presence in Manbij with U.S. forces had become a focal point in Turkey's tense relationship with the United States, a NATO ally. Ankara trumpeted the Kurdish militia withdrawal as a triumph and a template for a further rollback of YPG-controlled areas across northern Syria. “We expect this process to continue,” said the adviser. “Each issue is being addressed separately by working groups," he added, so as to prevent differences on one issue from affecting others. The adviser, however, acknowledged that no progress had been made on the key issue of a Turkish request for the extradition of Islamic cleric Fethullah Gulen. Ankara alleges Gulen initiated a failed 2016 coup that claimed 250 lives. The cleric, who lives in self-imposed exile in the United States, denies the accusations. The U.S. says extradition is a matter for the courts. Adding to the souring of ties is the imprisonment in Turkey of U.S. pastor Andrew Brunson. He has been jailed for nearly two years and is currently on trial on charges of supporting Gulen. U.S. President Donald Trump has strongly criticized the case, with some members of Congress accusing Ankara of hostage-taking. Erdogan has linked the Brunson case to calls for Gulen to be extradited. 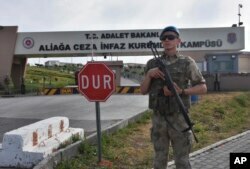 FILE - A Turkish soldier guards the entrance to the prison complex in Aliaga, Izmir province, western Turkey, where jailed U.S. pastor Andrew Craig Brunson is appearing on his trial at a court inside the complex, May 7, 2018. The Brunson case has become a lightning rod for wider U.S. concerns about Turkey. The worsening of bilateral relations is countered by Ankara’s warming ties with Moscow. 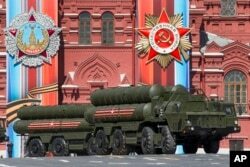 Erdogan spokesman Ibrahim Kalin on Friday reaffirmed Turkey’s controversial purchase of a Russian S-400 missile system. Washington strongly opposes the deal, warning the missiles could compromise NATO systems. FILE - Russian S-400 air defense missile systems are on display during a rehearsal for the Victory Day military parade in Red Square in Moscow, Russia, May 7, 2017. The S-400 controversy comes as Ankara and Moscow increasingly cooperate over Syria. While Turkey strongly backs Syrian rebels, it is working with Russia and Iran, which support the Damascus government, to end the civil war under a peace effort named the Astana Process. The Erdogan adviser sought to allay concerns by Turkey's NATO allies about its intentions toward Moscow. “The situation is a failure of the West to intervene in the Syrian conflict. It left a vacuum, which Russia filled. That has created a situation where we have to work with Russia,” added the adviser. Fears of a potential pivot toward Moscow are fueled by criticism of the decline in human rights in Turkey and Erdogan’s authoritarianism. Critics increasingly draw parallels between Erdogan’s rule and that of Russian President Vladimir Putin. Following Turkey's June 24 elections, Erdogan is likely to use his renewed electoral mandate to answer critics regarding his democratic credentials. International monitors have criticized the fairness of the election, which he won by a wide margin, but the actual voting and counting were broadly accepted by the rival candidates. Mehmet Altan, a Turkish newspaper columnist and academic, and his wife Umit Altan, speak to the media after being released from the prison in Silivri, near Istanbul, June 27, 2018. The Turkish president also reportedly is set to lift the much-criticized emergency rule introduced after the failed coup. This past week also saw an Istanbul court release from jail Mehmet Altan, a high-profile Erdogan critic; however, police raids on those who oppose the president, including some news media, continue. Analysts suggest such moves will be welcomed by Turkey’s Western allies, in particular the European Union. Human rights concerns are major obstacles to relations, but Brussels needs Turkey to continue a migrant deal that has markedly reduced the number of people seeking sanctuary in Europe. With Turkey currently hosting more than 3 million refugees, mainly from Syria, Erdogan is also looking to build on that cooperation. “There is a need for a strategic cooperation on refugees. The problem is going to continue with instability in the region. Turkey cannot take any more [refugees],” said the adviser.